Mountain views and rolling canyons provide a stunning backdrop to FireRock Real Estate, an 808-acre private golf and country club community in Fountain Hills, Arizona. A Master Planned Golf Community in Fountain Hills, Arizona. 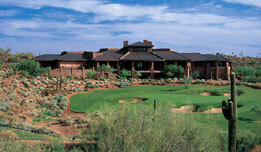 Firerock Golf Community is one of finest in the Scottsdale AZ Real Estate market. Firerock Real Estate, Homes and Firerock Golf Club are spectacular. Apart from the natural beauty of the area, the FireRock Country Club Golf course is one of the finest in the state and an incredible pleasure to play. FireRock Real Estate has it all...Elevated tees, raised greens and challenging approach shots. As the course winds around mountain views, each hole presents a unique challenge, governed by its own set of circumstances. No matter how many times you play, there's always something surprising and new to look forward to as you golf FireRock in beautiful Fountain Hills, AZ. Fountain Hills Real Estate has increased in popularity over recent years. With a vibrant, friendly community, exceptional natural beauty and championship level golf, Fountain Hills, Arizona is a great place to live and vacation. Arizona real estate agent Bill Slack specializes in locating the perfect golf properties like Fountain Hills Real Estate. Despite that fact that Fountain Hills real estate is home to many upscale Arizona golf communities like FireRock golf, it has been able to maintain that quaint hometown feel--Described as an upscale community with real hometown character. The main reason the community has been able to achieve this is due to the natural boundaries that surround Fountain Hills preventing massive expansion. Fountain Hills has limited ability to build more housing or golf courses. Fountain Hills Real Estate is limited in its growth. FireRock’s 18-hole championship golf course, stunning clubhouse, and more has become a magnet for golfers. Gary Panks, an award-winning architect, designed The FireRock golf course that offers challenging greens for golfers of any skill level. Local vegetation, green fairways, and stunning views of Red Mountain make it difficult for golfers to keep their eye on the ball. Just imagine playing 18 holes of golf through narrow canyons or overlooking the tees from your luxurious home built on the surrounding ridgetops. Described as an upscale community with real hometown character, Fountain Hills real estate is considered to be among the most desirable opportunities in Arizona today. The quality of life that is associated with Fountain Hills real estate is as evident as the breath taking natural beauty of the area. Fountain Hills get its name for its spectacular fountain in the center of town. Firerock homes for sale range from the $660k for townhomes/condos to many millions for single family residences. Offering access to many different community resources such as tennis, baseball, picnic ramadas, soccer fields, basketball courts and paved walking paths where residents can get a little fresh air and exercise, owners of Fountain Hills real estate have several unique ways to enjoy the community. The community also plays host to several different activities and events throughout the year which include formal galas, art festivals, parades, golf tournaments, theater productions, little league baseball, and much more. Firerock Real Estate / Homes and the Golf Community are well worth taking a look at, if you're looking for a luxury golf community in Fountain Hills. The beauty and luxury of this Fountain Hills /Scottsdale Golf Community make the drive to Firerock worth it. At Firerock there's a Luxury Home for sale or being built for the most discerning buyer. Firerock has numerous spec homes for sale or under construction. Let Bill Slack help you find the perfect Firerock Home for sale. When you decide to buy Fountain Hills AZ Real Estate, (whether it's Firerock Real Estate or some other premium Scottsdale/Fountain Hills AZ Real estate) be prepared to live amidst some of the most renowned luxury resorts and spas, championship golf courses, gorgeous homes, and natural desert beauty in the world. With all these amenities at your fingertips you’ll be living in paradise.